The story of Idris Mohammad could be titled ‘Just Takin’ Care of Business’. For all his life, from his birth in New Orleans in 1939 (apparently to a South Asian father and French mother) until very recently, Idris Mohammad has simply kept his head down and played what has been asked of him, usually from the bottom of the drums to the top. 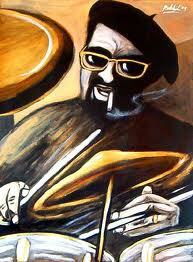 And in the process has blazed a trail that has been trod by almost every drummer who has followed him. Even though he didn’t pay much attention to the accolades he was getting from the jazz and R&B greats (Neville Brothers, Lou Donaldson, Roberta Flack, Pharoah Sanders, Curtis Mayfield, Rahsaan Roland Kirk to name just a few) who lined up to hire him, he was, by the mid-70s, considered to be one of the modern era’s great ‘jazz’ drummers. It is a title he has never felt comfortable with. “I had never heard of Art Blakey or Max Roach,” he confesses, “until I moved to New York.” And by that time most of his work had been with R&B artists who were attracted to his funky gumbo rhythms from New Orleans. “I was never a jazz drummer,” he insists. Believe him or not, he is credited with basically inventing the Acid-Jazz style of drumming which mixes jazz trimmings with funky, organ and horn driven soul and R&B. In the 80s he moved to Europe (Austria and UK) to ‘give my kids an education’ before returning to the States and heavy recording and touring schedule. When Art Blakey and Max Roach, the two colossi of the jazz trap sets, started including Idris in references to the ‘greats’, the hard working, humble, pioneer of the drums finally gave in and accepted the praise. 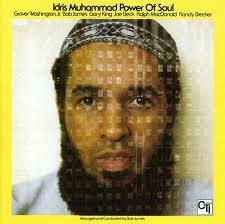 His album Power of Soul is as hot today as it was when it came out in 1974. 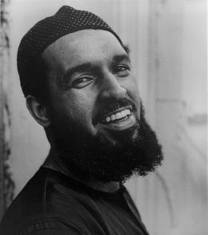 Probably the best example of the drummer at the peak of his driving, leading percussion making, it is another very interesting chapter in the tangled connection between Islam and American jazz. His name at birth was Leo Morris, which is unlike the names of any other sons of South Asians I know of. Bolgandreau,muito obrigado. unfortunately i can't read your wonderful magazine! even though i had intensive Portuguese lessons a few years ago! Anonymous, Yes, I know his birth name was Leo Morris. But I've read his father was Pakistani somewhere. Morris is not an unusual name for South Asian christians. Anyway, its part of the 'tangle'!